While Gareth Bale may have won the PFA Player of the Year award and Rafael van der Vaart impressed with his goals and assists, for Tottenham fans it was the diminutive midfield maestro Luka Modrić who deserved the Fan’s Player of the Year award. Sir Alex Ferguson is a known admirer of the Croatian and many Manchester United fans see him as the ideal replacement for Paul Scholes, while Tottenham fans who know how important he is will be desperate to keep him at the club. In this post I take a closer look at his passing in the 2010/11 Premier League season using data gathered from the Guardian Chalkboards. For this analysis I have considered only matches Modrić played in central midfield. Altogether the sample includes 2418 minutes played in 27 matches. 1338, or 55.3%, of those minutes were played in home matches, meaning his passing numbers may be slightly inflated from what they actually are. On the other hand he couldn’t have faced a more difficult range of teams. In the 27 matches in the sample he faced every team from the top nine in the final league table (excluding Tottenham of course) both home and away. He also faced teams 10-13 and 15 at home and teams 12 and 14 away. The only “easy” matches he played were Blackpool and West Ham at home and Birmingham and Blackpool away. Modrić was the fourth most active passer in the league; only Danny Murphy, Michael Essien and Barry Ferguson attempted more passes than he did. In the matches he played in central midfield he attempted a total of 1715 passes in open play of which 1483 were successful. Per 90 minutes he completed 55 of 64 passes. 55.5% of his passes were played in the opponent’s half, 44.5% in his own. Of his passes in the opponent’s half 47.1% were forward passes, 34.2% sideways passes and 18.7% backwards passes. Of his passes in his own half 42.7% were forward passes, 38.9% sideways passes and 18.4% backwards passes. His pass success rates in the opponent’s half for forward, sideways and backwards passes were 77.7%, 91.1% and 95.5% respectively. His pass success rates in his own half for forward, sideways and backwards passes were 75.2%, 96.3% and 97.9% respectively. The accuracy of his different passes and the total number of successful/attempted passes of each kind are summarised in the following table. 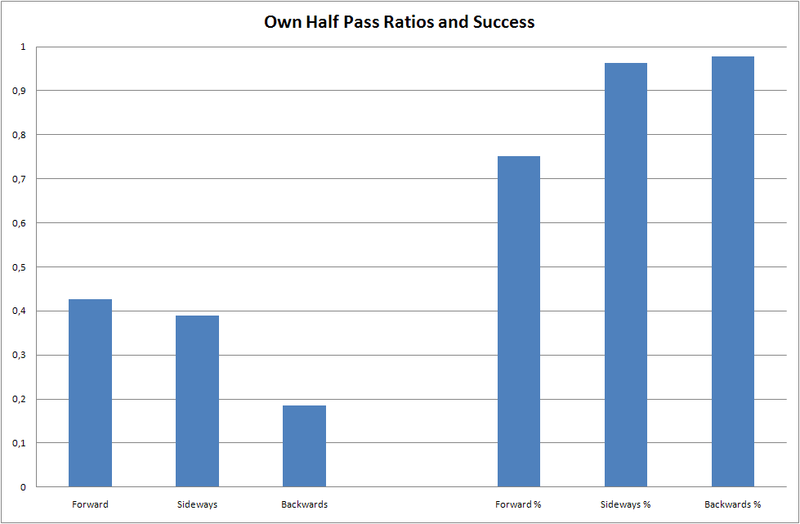 His lower forward pass success rate in his own half compared to the opponent’s half could be explained by the higher proportion of long passes he attempts. 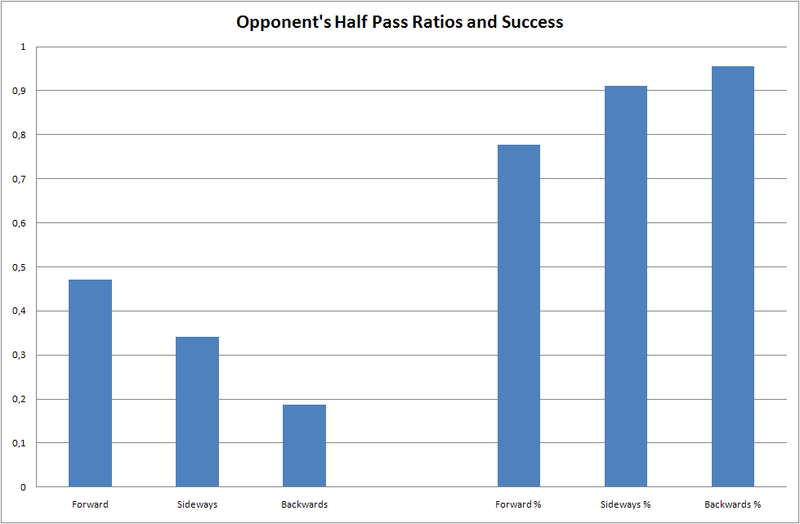 In the opponent’s half long passes make up 5.5% of his passes whereas in his own half they make up 8.5%. The long passes in his own half also tend to be more difficult forward passes whereas the long passes in the opponent’s half are slightly easier sideways passes. In the opponent’s half he completed 35/45 long passes, a success rate of 77.8%. In his own half he completed 30/57 long passes, a success rate of 52.6%. Overall he completed 2.42/3.80 long passes per 90 minutes. In 27 matches he attempted exactly 27 crosses with a success rate of 14.8%. Over the course of the season (including matches he played on the wings) he delivered 31 corners into the box, finding a teammate with 29.0% of them. His total cross success rate (including all crosses and corners) was 22.6%. Over the course of the season he created 2.06 goal scoring chances per match (source: WhoScored.com) but only 2 of those 64 chances were converted into goals. Possible explanations for this could be that Tottenham need to buy some better strikers, that for some reason the kinds of chances he created weren’t particularly good goal scoring chances or it could just be bad luck. Without more detailed data it’s hard to know what the reason is. To see how he performed against the strongest opposition I looked at the matches he played against Manchester United, Chelsea, Manchester City, Arsenal and Liverpool. He played all five teams both home and away and played the full 90 minutes in each match, and for the most part his numbers are similar to his overall numbers. On average he completed 51/59 passes of which 51.4% were in the opponent’s half. His ratios of forward, sideways and backwards passes and their corresponding success rates in the opponent’s half were 43.0% (79.2%), 39.1% (89.0%) and 17.9% (96.3%) respectively. The corresponding numbers for his passes in his own half were 37.9% (71.3%), 42.8% (94.3%) and 19.3% (100%). He also completed 2.4/4.4 long passes per 90 minutes. As you can see he attempted slightly fewer passes and more of his passes were in his own half, he was slightly more conservative in his passes in terms of forward and sideways pass ratios and he attempted slightly more long passes, but for the most part the numbers stack up well which suggests he doesn’t wilt under pressure and is capable of performing at his usual level even against the best opposition. If you compare my long pass numbers to the numbers from for example WhoScored.com you will see they differ quite a lot. I think this can be explained by me being a lot stricter in my definition of a long pass when gathering the data. Those stats dont really mean much with nothing to compare them to. e.g. “In 27 matches he attempted exactly 27 crosses with a success rate of 14.8%.” 14.8% doesnt sound too good but it might be when compared to the average of similar players? So the stat doesnt really mean anything. Unfortunately that kind of information isn’t publicly available so the only player I can compare him to is Nuri Sahin who had an overall cross success rate of 37.4% from 211 attempted crosses in the 2010/11 Bundesliga. He’ll do then, sign him up.